Phu Kradueng National Park, situated in Si Than Sub-district, Phu Kradueng District, Loei Province, has been designated as the 2nd national park of Thailand on November, 23, 1962. It covers an area of 348.12 Kilometers (217,575 rai) with 60 Kilometers (37,500 rai) of plateau on the top of mountain. The elevation of Phu Kradueng is between 400-1,200 meters with the summit point of 1,316 meters at Khok Moei. In general, Phu Kradueng is the sandstone mountain consisting of an abundance of flora and fauna and the fullness of cliffs, savanna, streams and waterfalls other than that it is still the head watershed of Lam Nam Phong River which is one lf the most important rivers in Northeastern Thailand. According to its high elevation and climatic condition, the weather on the mountaintop is cool all year round. Sometimes, in the winter. temperature may drop to freezing point. 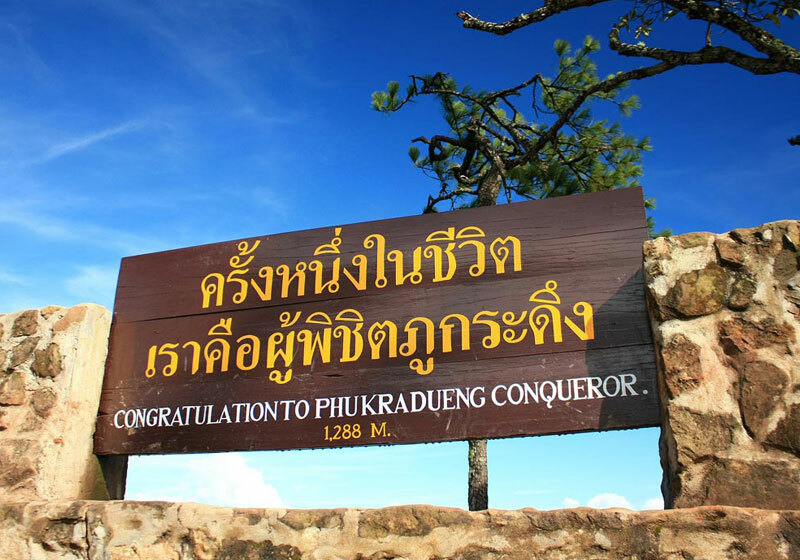 So, it is the most incentive to visitors who would like to be the Phu Kradueng conqueror at least once of their life. Short Description: Phu Kradueng National Park, in the Si Than sub-district of Amphoe Phu Kradueng, Loei Province, is one of the best known national parks of Thailand, with a high point of 1,316 m elevation at Khok Moei.